D. and I are picky about bread. Sometimes, it can make or break a meal. 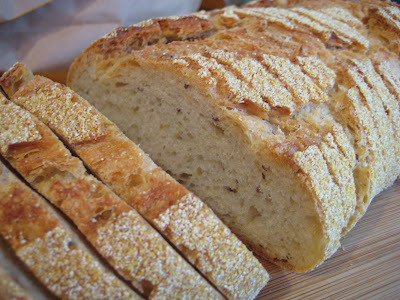 In the last few days, we've brought back some delicious bread from two San Diego bakeries. Bread & Cie has a retail location in Hillcrest, but they also supply bread to local branches of Ralph's and have a stand at the Hillcrest farmer's market on Sundays from 9am-1pm. Bread on Market is located in Downtown San Diego with a similar menu of sandwiches, soups, and several savory dishes. 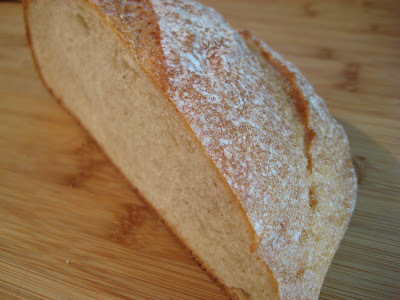 Bread on Market's rustic country bread is a smooth and soft white bread that looks and tastes like it contains a small portion of wheat flour. The crust is surprisingly pliable and this bread is good as a side or for sandwiches. As mentioned in my previous post, it's great dipped in citrus olive oil mixed with a little honey. I love rye bread and word on Chowhound (thanks, Josh!) was that Bread & Cie made some of the best rye in town. 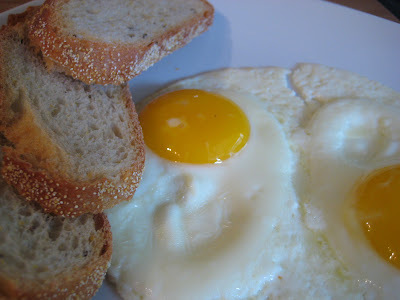 One of my favorite breakfast dishes is sunny-side-up eggs with rye toast. I made a run to the Hillcrest location to pick up a loaf. 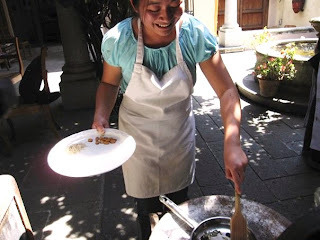 It's corn-based with caraway seeds. Yum. I love caraway's pungent licorice flavor and it's especially good with strawberry jam. I know, sounds weird, but it's a very good combination. My breakfast this morning, along with espresso. While I was there and dealing with the hellish parking in Hillcrest, I decided to pick up a loaf of their country levain. It's a wheat sourdough loaf that's a little lighter and less sour than classic sourdough. It's good as a side or for paninis. Since it's quite crusty, the crust has to be trimmed for panini grilling. 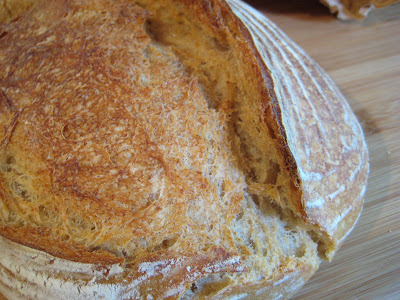 I loove Bread and Cie's levain - just bought a loaf today myself. Never thought about using it for panini, but I guess we could if we trimmed the crust!